Like Carrie Elspeth? Click here to view the entire range. 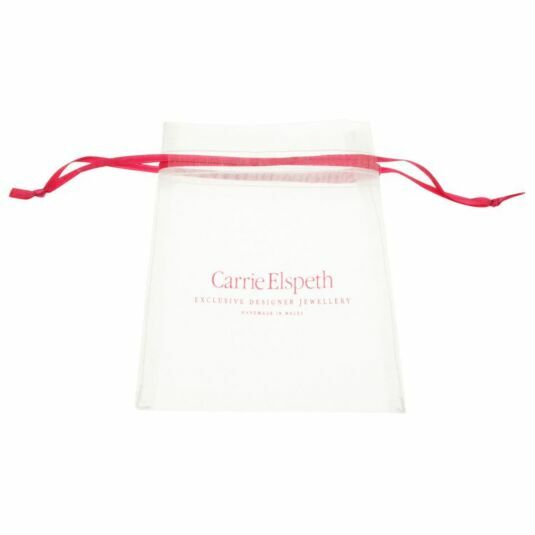 This small organza bag from Carrie Elspeth will soon turn your piece of jewellery into a beautiful, ready to give gift. Perfect for necklaces, bracelets, or earrings, simply place your chosen piece inside the clear bag and pull together the pink drawstrings. Please note that these bags are not suitable for sentiment bracelets due to the size of the sentiment card. Carrie Elspeth is the kind of woman that we here at Campus admire massively: she had a passion, decided to try and make a living from it, and then – for want of a better phrase – absolutely smashed it. In the space of a little over ten years, she has gone from a little known jewellery seller to one of the market leaders, employing multiple staff and producing several ranges every year. She continues to strive for excellence and receive recognition, both in terms of awards and, more importantly, in terms of customer satisfaction. With a background in design and a childhood filled with making jewellery for friends and family, Carrie set up her jewellery business in 1999. Determined to become a market leader in creating a well-designed, accessible and beautiful product that would be handmade locally, Carrie's business foundations still hold strong to this day. The business has grown incredibly since Carrie first opened a little studio in the rural market-town of Cowbridge, South Wales. She now occupies a large studio-warehouse in the same town (not just on her own, obviously), employs 10 staff and has a team of 25 local outworkers who manufacture the jewellery to the same high standards that Carrie first implemented a decade ago. Carrie still gathers beads from all over the world, choosing carefully for each new range she designs, inspired by colour and shape as she always has been. Three full jewellery Collections are launched each year, keeping shop displays fresh and the many Carrie Elspeth fans happy. 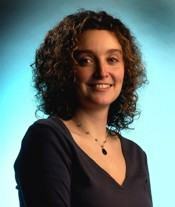 The hard work and commitment from Carrie and her dedicated team has not gone unnoticed. Carrie was recently crowned winner at the Welsh Woman of the Year Awards for Best Small Business Owner, fending off fierce competition from Catherine Zeta Jones (not really), and achieved the glowing accolade of being finalist for "Best Service to Independent Retail" at The Greats industry awards. She has also won the Welsh Young Business Achiever and World Young Business Achiever in Innovation and Design awards, culminating in an invitation to Buckingham Palace to meet the Queen! Awards are a welcome boost from the industry, but what drives Carrie forward is the positive response she has always got from all of you, the people who buy and wear her jewellery. With every new Collection she designs and launches, Carrie is re-invigorated and re-inspired by the comments she receives, and will continue producing beautiful, accessible, handmade jewellery as long as she can.